I read Smart Couples Finish Rich and Smart Women Finish Rich. 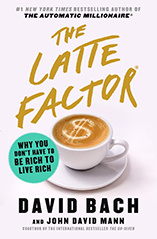 When I got to the chapter on making more money, I was inspired by the idea that even in a recession (like the current economic slump), employers will give raises to valued employees. I work for a small 14-person start-up, and while I knew the business was doing well and I am one of the top employees on the team, there were no instituted performance reviews and any salary increases were going to come from me asking. Coincidently, I was reading your books at the same time that the President announced he was going to sit down with each employee and discuss retention (we’d recently had some employee attrition) – I thought “here is my opportunity.” I worked through your steps on an abridged time frame, practicing how I was going to ask for a raise, obtaining from one of the VP’s data about my level of productivity relative to others on the team, and really figuring out how I add value to the office. Finally my meeting came, and toward the end, the President asked “is there anything else you want to talk about”. I replied “I want a 10% raise.” He looked at me, mumbled a “I’ll have to get back to you on that”, but then asked how I came up with that figure. Now my homework paid off – I listed the reasons I had come up with for how I added value, cited the productivity metrics, and gave him nowhere to go. I now make 10% more and it only took two weeks.